Scooters have been the number one choice of toys for kids for decades, but it’s only in the last 5 years that the scooter market has gone through the roof. So many new designs, technology and methods of build has made scooters one of the most popular toys on Amazon. There are two wheeled scooters or three wheeled, there are scooters that come designed for winter snow or dry summer surfaces, there really is so much more out there than there was when I was a kid, i’m almost jealous! Below we have put together our list of the ten best scooters for kids across a variety of designs and age groups, along with a brief description and links through to amazon to take a closer look at each of them. 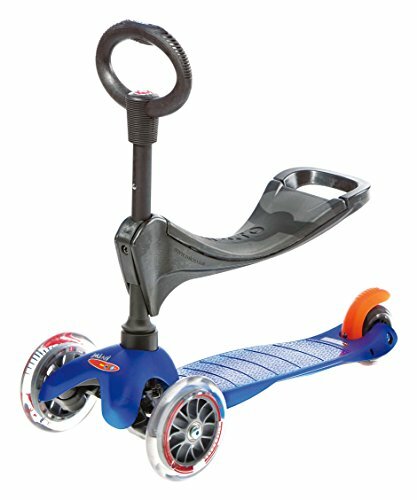 This Mobius scooter for kids weighs in at under 12lbs, and brings with it a number of features to help your kids learn to ride safely and easily. First off, for stability and comfort there is the three large 5 inch wheels with two at the front and one at the back, then you have a Stainless Steel ABS braking system, great for stable but powerful breaking. The Mobius kids scooter is easy to fold up and also easy to extend, so the scooter can grow as your child grows. Mobius provide a great 2 year warranty along with the 30 day full refund policy. This product is a big winner scoring a maximum 5 out of 5 in customer reviews at the time of writing. Good for kids just beginning to ride, this lightweight, three-wheel design offers more stability and control. Riders simply climb on and propel themselves forward using a slight wiggle motion over the back two wheels. And because there isn’t a motor, the speed remains at a manageable pace. The front wheel hand brake provides additional safety as well. The Sporter handles can be raised to grow with the child and the scooter can support up to 176 lbs. Another benefit of this scooter is that it folds in half for easy storage or carrying around. The Sporter is available in 4 colors: blue, red, green and pink. The Razor is the original kick scooter built of aircraft-grade aluminum. 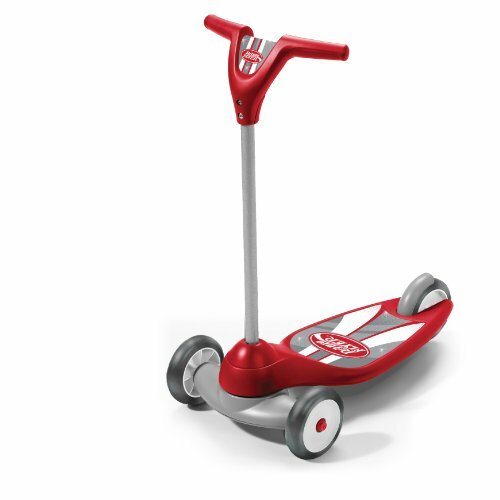 The Jr. Lil’ Kick scooter, as the name suggests, is their safer version for small kids. 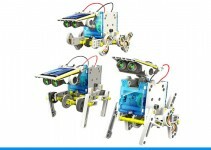 It is sturdy yet light, weighing only 6 lbs and the machine can carry about 140 lbs. 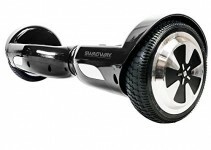 With larger wheels than most scooters made of urethane, the Razor rides well over uneven surfaces and will last longer. The rear fender brake which you stand on to stop or slow the machine is a sleek feature you won’t find on similar designs. The handle bars are adjustable for riders and the entire scooter can be folded into a compact 2 feet. The Razor A Kick comes in: black, blue, pink, green and red. This unique scooter design is more like a bicycle in a scooter’s body. The 12″ inflatable tires offer a smoother ride on multiple terrains like gravel and sand. The BMX style handlebar, spoke wheels and a steel frame offer a durable system that will hold up to a beating at the bike park. This design is probably best suited for a more seasoned rider as the scooter comes with axle pegs, making it trick ready. For added safety, however, the Mongoose Scooter has alloy caliper hand brakes to manage speed. The Mongoose is available in grey. In an effort to help the environment, this scooter is made of all green materials. The aircraft grade aluminum is lightweight weighing only 10 lbs but is sturdy and can support up to 220 lbs. The bottom portion of the scooter is specially treated to ensure its smoothness which makes it good for grinding. The handlebars are just slightly slanted making tailwhips and bar spins easier as well. The wheels are high grade urethane perfect for shock absorbing. For added safety, the rear wheel is covered by a fender/spray protection which hardens to ensure durability. Vokul scooters come in: black, white, green and orange. This three scooters in one ride is great for younger kids learning how to scoot. This scooter will grow with a child starting from just one year old with the seated option, using the O-bar for balance. 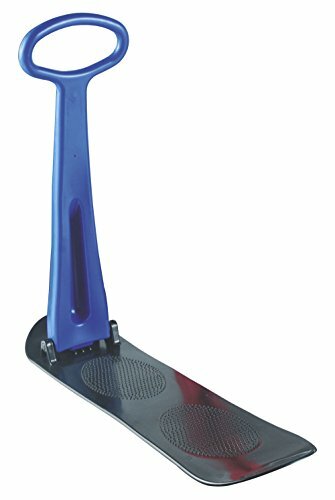 An easily removable seat then offers the chance for walking toddlers to practice scooting, still using the O-bar for balance. The final stage offers a taller, more sturdy T-bar for older kids. The entire systems is just over three lbs and can support up to 30 lbs. Micro Mini 3-in-1 Scooters can be found in: pink, blue and purple. This scooter can go from the street to the snow in just seconds. This Railz design comes completely assembled and ready to ride. The wheels ride like a traditional scooter but can be replaced with skis that cut through the snow for easier movement. Also available with the unit, a ski brake, which allows the rider to slow down or stop at will on the snow. With a 200 lb weight capacity, this scooter is good for all ages. Railz Snow Scooter is available in red. No need to confine the fun to the summer months, this scooter is made just for the snow. Made of polyethylene, this design is capable of handling up to 200 lbs. The snowboard-like base is great for sitting or standing. For added confidence while riding, the board has foot pads for extra traction. Easy to store when the temperatures heat up, this design folds down to a very compact sized unit. The Snow Scooter can be found in blue. With all the bells and whistles in one design, this scooter is specifically designed to accommodate a taller rider. As with other three-wheel designs, this machine allows riders to sway from side-to-side to build up speed and allows for a full 360 spin. The light frame makes drifting easy and the removable stability bars, coupled with foam grips and high-performance bearings are perfect for newer riders. 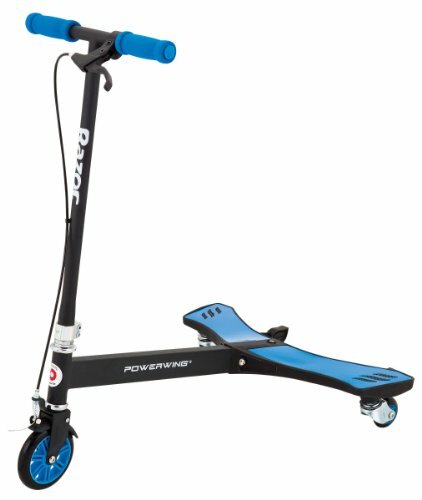 The PowerWing Caster Scooter comes in: Black, silver, red, pink and blue. Designed with two wheels in the front and a wider base, this beginner scooter promotes stability and balance. For extra control, this scooter has ergonomic grip handles, a foot brake and a wide turning radius. The plastic frame will be able to take a beating from a little tyke just learning to maneuver and it can support up to 50 lbs. This Micro Mini scooter from Seeis comes stacked with safety features and adjustable parts to help you configure the scooter for your child and adjust it as they grow. The handle bars adjust from a height of 19 inches up to 28 inches, and the seat is also height adjustable or removable once your kid is no longer a toddler. 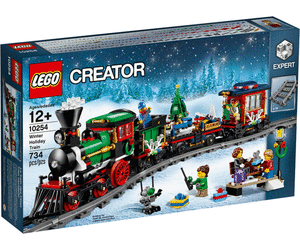 The flashing LED wheels add an element of fun to the design. The rear paddle brake is another great little safety feature for use when the safety seat is removed and your kid is balancing on their own two feet. What I really love about this scooter, is the wide customization options to really get the scooter to feel and fit right for every individual. 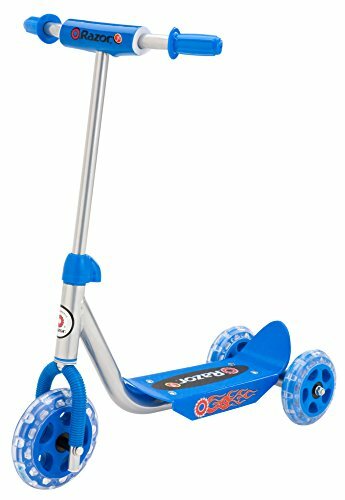 This kids scooter comes very highly rated on Amazon, with many raving about the ease of assembly, the quality feel to the build quality and the ability to adjust all the parts. For a toddler, this is a great scooter to learn and build confidence. 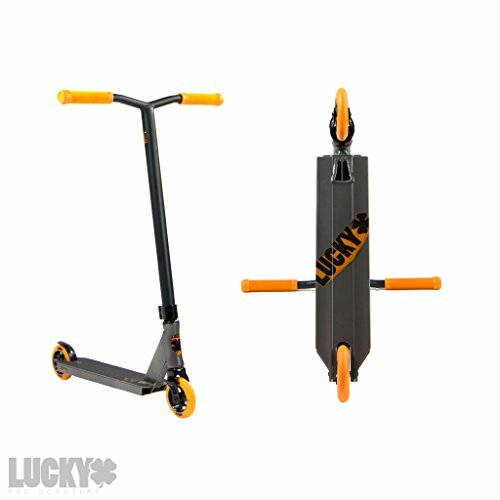 Lucky are known for making high quality pro stunt scooters, and the Crew Complete Pro Stunt Scooter in their 2018 range is no exception. 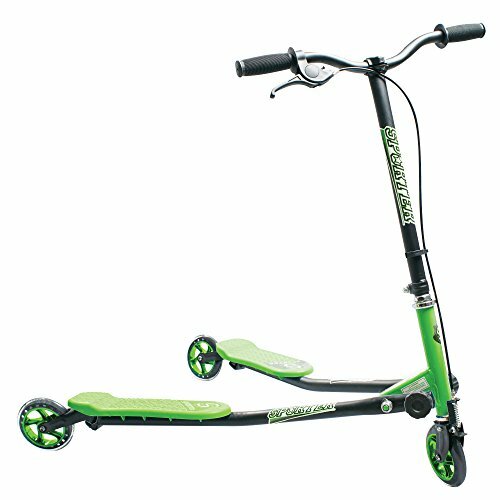 This is an entry level stunt scooter, great for kids that want to step up their skill in freestyle or start to learn new tricks. The stunt scooter may not look like much, but the build quality is exceptional. The reinforced deck is made from aircraft grade aluminum and is not only light, but can take a beating. The small 110 mm wheels are great quality, and the SteelyBrake breaking mechanism is exceptional. 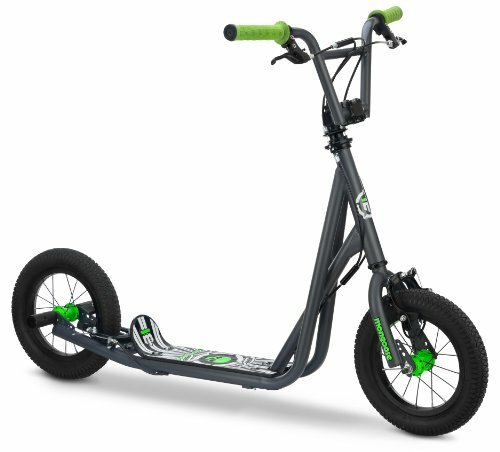 Rather than a standard T-bar, the Lucky Crew stunt scooter comes with a kink bar that has an incline in toward the rider. 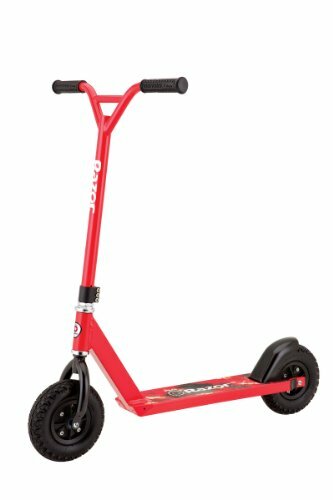 If you are looking for a first stunt scooter for a kid, this is a great option. As it’s an entry level scooter it is much cheaper than advanced models, it is stacked with pro features and comes with a 6 month warranty for peace of mind. The Razor Pro RDS Dirt Scooter is a champion of Off Road scooters. Sporting thick air-filled 200 mm BMX style tyres, reinforced aluminum deck and BMX style fork, this scooter is made for owning a dirt track and a king amongst its peers. The rear fender brake provides control over speed and the deck is coated in grip tape for superior balance and control. 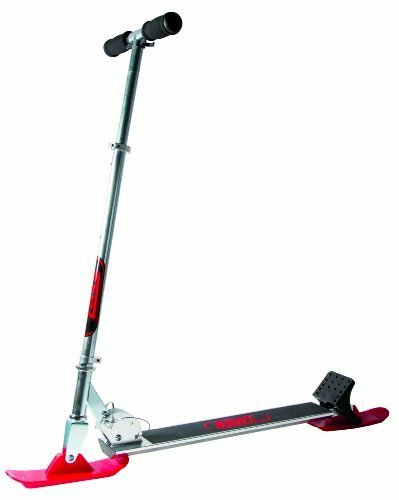 The Razor Pro RDS Dirt Scooter is for kids that have some experience with tricks, perhaps they have had a stunt scooter and want to take that to the next level. 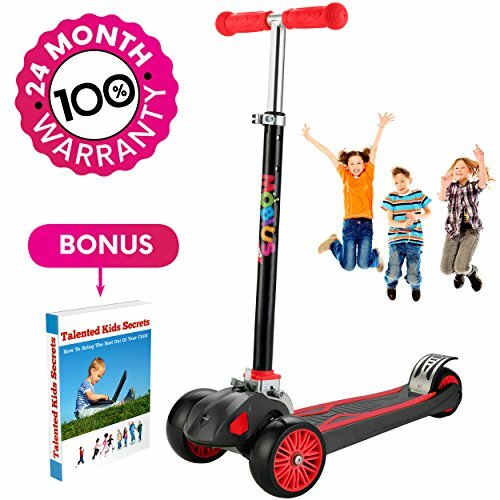 So above we have shown you a selection of the best scooters for kids that are available to buy now, but before you do there are some things to consider and be aware of to help you decide which one is best for your child. Here are a few things to think about to make sure you get the right fit for you and your kid. If a scooter is designed for kids 8 and over for example, the rating is there for a reason. 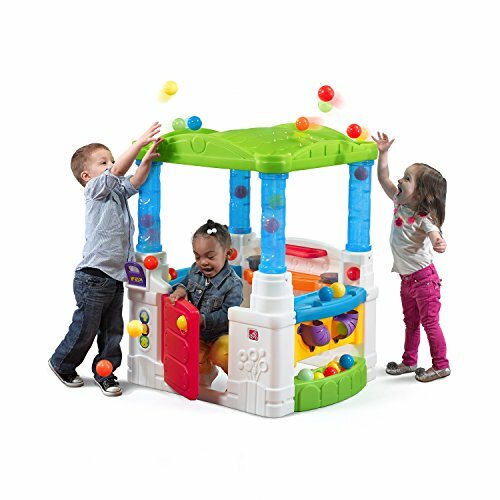 Usually the wheels may be very different to allow more advanced movements and tricks that would not be suitable for a younger child. The frame will be bigger, and there will likely be less safety features that you would want for a younger child. A scooter with a low age rating on the other hand might have a maximum weight level suited only to young kids and therefore not suitable for older children as they grow. As a guide, we would advise following the rating not just for safety, but if your child is just starting out, they need to build confidence and experience to become a safe rider and to enjoy scooting. Buying something too advanced for their experience level may just put them off or make them feel uncomfortable. There are three general forms of propulsion for most scooters and these are kick, swivel or electric propulsion. Kick propulsion is the most common for all scooter types, whereas swivel propulsion is for caster scooters that have a particular type of swivel design. Electric propulsion speaks for itself, replacing the need for the general ‘kick’ motion with an electric motor. 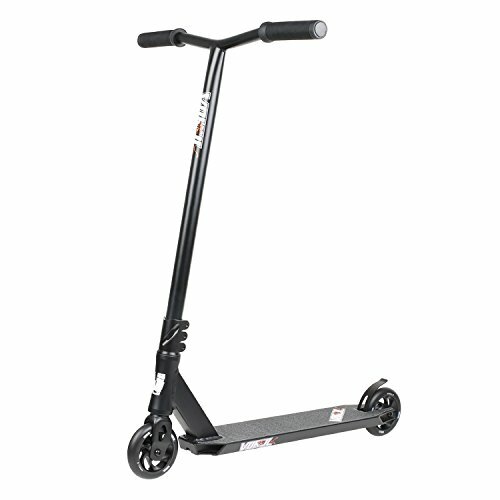 In terms of steering, the vast majority of scooters come with a T bar for balance, manoeuvrability and stabilization. Scooters for young children often come with added features to enhance stabilization while they become familiar with their new skills. Most scooters have quite a large weight capacity, over 200 lbs and suitable for most kids, but some especially for younger kids can have a much lower weight capacity. It really depends on the quality of the materials used and on the design of load bearing surfaces on the scooter. It is important to know the weight range for a couple of reasons. If you are buying a scooter that will grow with your child and suit them for a few years to come they may out grow the safe operating weight. If you are planning to help your child learn by showing them how to use the scooter directly, then you need to make sure it is rated to hold your weight or you will end up breaking their heart when you snap it in two. No one wants that! This is the kind of scooter we had when I was a kid, usually two wheels (thought the Razor Jr. Lil Kick scooter above is three wheeled for young kids) with no fancy frills to generating your momentum. You simply create momentum by pushing off against the ground with your foot to glide the scooter forward. You will usually find that for younger kids these come with three wheels, and for older kids two wheels as they become more advanced and competent. A stunt scooter can come in a variety of different shapes and sizes for pulling of a wide range of tricks and movements. There is no standard form or shape and they are evolving all the time. Some come with very small wheels, some with BMX style inflatable tires with spokes for taking them all terrain. Some are kick propelled while others use a swaying momentum to build up speed. A stunt scooter as a guide is for a rider that has a bit of experience, pushing toward the advanced. These are scooters that have modifications to the base to allow for use on ice and snow. Some come with a snowboard style base and others have interchangeable ski’s that can be put on over or in replacement of the wheels. Kids love playing in the snow and snow scooters are a relatively new way for them to have some fun in those months where the pavements are not really suitable for wheels. Caster scooters differ from kick scooters in a variety of ways. First, these scooters have three wheels, two at the back and one at the front. The two rear wheels are wide apart rather than close together like the three-wheeled kick scooter variety. They have a completely different design of deck. Rather than having a deck that runs from the back to the front, a caster scooter has a deck that spans the rear two wheels. This design favours a ‘sway’ motion to build momentum rather than kicking off the ground. Riders will sway side to side, and the 360 directional rear wheels react to the sway to build speed and momentum. The deck may also be split rather than a solid’ bridge’ type of deck. In these instances, there is a narrow deck over each of the rear wheels rather than one solid deck that spans the gap. This type of caster scooter allows much more freedom of movement for each leg of the scooter. Off Road scooters tend to come with large wheels, with thick rugged tyres, much like that of a BMX. Often the tyres are air filled and the deck is robust to withstand the ups and downs of rugged terrain. Off road scooter frames are also usually a bit larger, with thick rubber grips on the handle bars. These are great for ramps, flips and jumps, or any of the tricks you would pull off with a normal stunt scooter, only on an off road track instead. Electric scooters come in all shapes and sizes for kids of all ages. There are 3 wheeled electric scooters for young kids, electric trike style scooters with or without seats, there are even electric stunt scooters. These are basically scooters that have an electric motor in them to provide propulsion, with speeds that vary from 1 mph to 15 mph generally. Slower speeds are more common on electric scooters for young kids whereas the faster speeds tend to be on scooters aimed at older kids or teens. These are the type of wheels you will normally find on a pro or stunt scooter. The size of the wheel is reduced to allow greater speed and less surface area which in turn requires less effort to push or ‘kick’ to build momentum. This type of wheel is suited to smooth terrain such as pavements or concrete skate parks. Standard scooter wheels are usually made of the same material as small solid wheels, but are larger. While these wheels may require more effort to build momentum, the larger surface area gives more stability and control of the scooter. Again, this type of wheel is suited to smooth terrain such as pavements where debris is minimal. Off road tyres tend to be larger and often air filled to allow some form of shock absorption over rough terrain. Usually made of soft rubber, like the tyres on a BMX they are designed to take a beating and handle debris, dips and rough ground. These are good tyres for some basic tricks too such as jumping or wheelies. As the name suggests, scooter skis are for tackling winter surfaces that are coated with snow or ice. The ski either attaches onto the frame in replacement of the wheels, or attaches over the wheels depending on the design. With a ski addition to a snow scooter, you can continue to enjoy your scooter even through the cold winter months, just as much fun as sledging if you have the right terrain. Just make sure you have some safety gear as always, as snow can often hide unexpected debris. A foot brake on a scooter usually comes in the form of a pedal plate over the back wheel. To activate, the rider puts pressure on the pedal plate with their foot, which in turn puts pressure on the rear wheel to slow the scooter to a stop. Hand brakes are more commonly found on scooters with larger wheels, such as off-road scooters. They work much in the same what as the calliper breaks on a bike, activated by squeezing a break leaver situated on the handle bars. Toddlers learning to use a scooter, regardless of the type, should always be supervised by an adult. There are scooters that come with a detachable seat that can be attached for the youngest kids and later removed as they grow and develop more skill. In addition to this, a good safety helmet, knee pads and gloves are always a good idea as they are most likely to fall occasionally while getting the hang of it. Another good tip is to survey the area they are going to ride on first, to make sure there are no hazards such as large stones, potholes or broken glass that might cause the scooter to jar or your child to fall. Older kids that have acquired more skill require less supervision, but the three key items of helmet, knee/elbow pads and gloves are a good safety investment, no matter how hesitant they are to wear them. In addition to safety helmets and pads, the real danger with using a snow scooter is the risk posed by impacted ice. When ice compresses and turns to sheet ice, it can be very quick, slippery and solid and there is always the risk of injury here, particularly on slopes. Now while slopes may be fun for sledging and using snow scooters, it’s important to make sure there is powder snow on top to provide at least some grip and stability. Off road scooters are always going to give balance more of a test, navigating uneven surfaces and potentially hidden hazards. Hopefully this guide has helped you to understand a bit of the jargon and think about how to choose the best scooter for your kid, and with our selection of scooters above we are sure you will find the best fit amongst the highly rated selection that we’ve reviewed.